Land ownership issues are a major challenge for urban community farming and gardening movements in many cities. When neighborhood groups spend time and resources to steward vacant parcels, they often do so at the risk of having their efforts wasted. An absentee landowner may at any time decide to develop or otherwise restrict access to a parcel, leaving the neighborhood group with no recourse to recover their investment in the land. In 1996, the City of Chicago, in partnership with Chicago Park District and Forest Preserve District of Cook County, recognized this problem and took steps to solve it by forming NeighborSpace, an independent, 501(c)3 nonprofit land trust to help preserve community-managed open space. A land trust is an independent, private, often non-profit organization whose mission is to conserve land. Land trusts have several tools to achieve their purpose; they may hold conservation easements, which restrict the use and development of the land in perpetuity. They may also hold a deed restriction to achieve the same outcome. They may also own land outright, whether by acquiring it or receiving it through donation. They may enter into a long-term lease or land contract agreement with a landowner to enforce a conservation agreement over a specified period of time without restricting use in perpetuity. Land trusts may also engage in stewardship of the land, which can include monitoring, ecological restoration activities, and legal defense of the trust’s interest in the land. Most land trusts across the nation rely on grants and private funding to preserve large, ecologically significant tracts of land in rural areas. NeighborSpace is unique among land trusts in several aspects. Although it is a private non-profit, it is largely supported with public funds; over 80% of its operating budget is directly subsidized by its three founding agencies. Other funding comes through grants, private donations, and other public bond monies. It has an exclusively urban focus, working solely within City of Chicago city limits. And a third of its lands are utilized as community gardens. NeighborSpace grew out of a mid-nineties city planning effort to create an open space plan for the City of Chicago. At the time, Chicago ranked 18th out of 20th for urban open space compared to other metropolitan areas of a similar size. 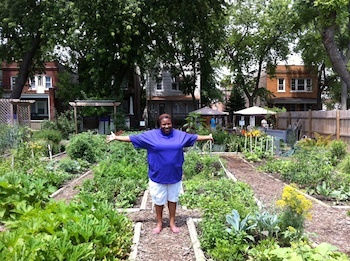 The CitySpace plan set ambitious goals for community gardens, school parks, and pocket parks. NeighborSpace focuses exclusively on land preservation issues, leaving stewardship—whether that entails building a community garden or performing ecological restoration—to the community organizations it partners with. Of the 86 sites currently under NeighborSpace’s purview, ⅓ are community gardens, ⅓ are native prairie restoration sites, and ⅓ are a mix between the two, according to Helphand. NeighborSpace owns most of the sites and leases several. It does not use conservation easements as a preservation tool. NeighborSpace negotiates the preservation of the land with the landowner, performs environmental assessments and title work, holds the title, easement or lease, provides liability insurance and legal defense, and works to secure a dedicated water line for every preserved parcel. Local community groups coordinate all gardens and ecological restoration projects. NeighborSpace provides some guidance, including a signage template, a list of gardeners’ rights and responsibilities, and a tool lending library. NeighborSpace grows by 3-5 sites per year. Often, a community group will approach NeighborSpace with a potential project, and the organization will conduct testing and title work and coordinate with the city and landowner on preservation options, with a goal of permanent preservation and stewardship of the parcel. “Cities would look to create an entity like NeighborSpace to have someone on the ground, working directly with community groups and being a conduit between government and those groups,” says Helphand.